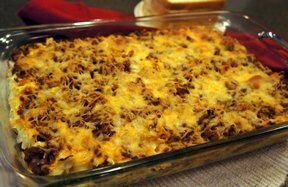 Tasty and creamy casserole that can be whipped up and baked off the next day. Perfect for those busy days and evenings. this is similar to lasagna but much easier. 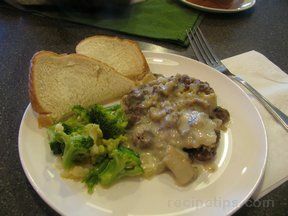 In large skillet, brown beef; drain. Add onion and green pepper; cook slowly until vegetables are tender. Add garlic powder, sugar, Worcestershire and tomato sauce. Add salt and pepper to taste. Simmer for about 20 minutes. While meat sauce is simmering, cook noodles in boiling salted water according to package directions; drain noodles. Place hot noodles in a bowl with the cream cheese and sour cream. Stir until noodles are coated. Add green onion, if desired. 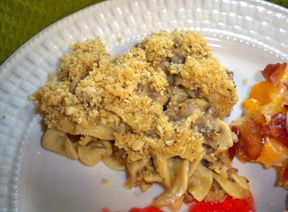 In a lightly greased baking dish, layer 1/2 the noodle mixture and 1/2 the meat mixture. Repeat. Top with cheddar cheese. Bake at 350° for 20-30 minutes. "I loved the creaminess of the noodles. 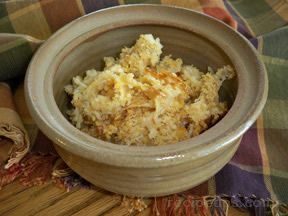 My kids were a little scared when they saw the cream cheese go in, but there wasn't much leftover so they got over it."